Dads Special Wish Jar is a thoughtful way to show Dad just how much you love and appreciate him. Have the whole family write down their wishes for Dad and put them in one jar, or each person can make their own, either way he'll love this gift! Make this easy for toddlers or preschoolers by helping them think of and write down their special wishes for Dad. 1. If your jar's lid is a funny color or has labels you'd like to cover up you can paint it. Use acrylic paint meant for metals (under $2 at your craft store), you'll probably have to give more than 1 coat. 2. Cut your paper into strips, around 1/2" or 3/4" thick. On each piece of paper write your special wishes for Dad. Once you're done, roll them around your finger, or around a pencil and put them into the jar. 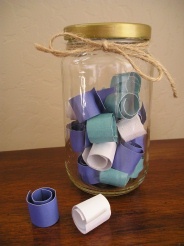 Tie a piece of twine around the jar's lid, and you've created a very thoughtful gift for Dad! !